If you own a female guinea pig who just gave birth to a litter of tiny pups, make sure she has the opportunity to live in an environment conducive to properly raising her new additions. That involves making sure that she and her offspring are in no way accessible by the father. Female guinea pigs are usually pregnant for 59 to 72 days. As parturition approaches, split up the boars and sows. Male guinea pigs can impregnate the females quickly after their litters emerge, sometimes in merely 12 hours. Since this can be extremely tough on sows' bodies, and therefore dangerous, it's vital to never let this happen. The way to prevent it is by making sure that mothers and fathers aren't together post-birth. Apart from the body stress, an additional pregnancy can be highly disruptive to a female guinea pig who is busy looking after and nursing her youngsters. Guinea pigs mothers do not need help from the fathers in looking after their juveniles. 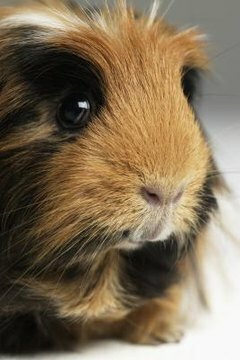 Male guinea pigs should be separated from their pups, at least for most of the time, simply because the little ones have to be with their mothers. Newborn guinea pigs can meet their fathers, but only if their mothers aren't around. Don't allow female pups to encounter their dads once they're 21 days old, however. At this point, the fathers can get them pregnant, which also can be extremely hazardous to young female cavies' bodies. It's important to split male and female guinea pigs up by the time they're 4 weeks old. If you don't, mating is just a matter of time. Not only can male siblings mate with their siblings, the males can even do so with their mothers. Prevent breeding from occurring by putting guinea pigs in separate "male" and "female" designated enclosures. Always keep an eye on guinea pigs living together to make sure they're getting along well. Aggressive behavior is a possibility in male cavies. While neutering and spaying can stop guinea pigs from breeding, the processes aren't necessarily the most effective solutions for the dilemma. Not only can the surgeries be extremely costly for guinea pigs, they often come with some drawbacks. Neutering and spaying surgeries can place stress on guinea pigs, and not all of the rodents handle the medical procedures well. Anesthesia, for example, can sometimes be trying on their wee bodies. Keeping male and female guinea pigs apart is often a much easier way to eliminate the chances of pregnancy. Cavies can be highly prolific breeders. Females can sometimes bear upward of five litters annually. It's highly uncommon for guinea pig fathers to eat their newborn babies. That behavior is much more common in other types of rodents -- specifically scared and frustrated hamster and mice fathers. While it's important to keep male guinea pigs away from new mothers, cannibalization of their offspring isn't a big source of concern.